MobiJuce™, Hong Kong’s First Shared Power Bank Rental Platform, has passed ONE MILLION rental minutes!!!! To celebrate its first ONE MILLION minutes, MobiJuce™ incentivizes new and old users with shopping cash coupons. [19th June, 2018 Hong Kong] Within just 6 months, people in Hong Kong have proven they enjoy and welcome MobiJuce™ shared power bank rental service because they used more than One Million minutes since its launch in December 2017! MobiJuce’s users are growing rapidly and its locations are trying to catch up with demand. The App-based platform is fully automated and now conveniently servicing across Hong Kong, including all AEON stores, Chow Tai Fook, K11 in Tsim Sha Tsui, Grand Plaza and Gala Place in Mongkok, Moleskine shops, Yoho Mall in Yuen Long, Causeway Bay Plaza II, California Tower in Lan Kwai Fong, and Landmark in Central. On this exciting occasion of celebrating the first million minutes, MobiJuce™ will incentivize old and new users with shopping coupons. From now until 31st July, 2018, MobiJuce™ users can convert their rental usage into cash coupons to redeem at McDonald’s, Starbucks and Aeon. MobiJuce will indeed “Juce up people’s lives.” For details of the program please refer to the MobiJuce™ Facebook Page. MobiJuce™ is a lifestyle ecosystem in the digital age, leading a smart and intelligent consumer trend. In November 2017, MobiJuce Limited introduced a fully automated mobile charger rental service to Hong Kong for the first time. The concept of the Internet of Things allows consumers to enjoy convenient, mobile and rapid mobile re-charging solution on a shared platform, thanks to the clouds technologies. The slogan ‘Juce Up Your Life’ emphasizes on connecting consumers to retailers and other destinations with their daily needs and developing a user-oriented shared economy. MobiJuce™ realizes a platform of smart living, a network of people, commerce, products, and flow while driving footfalls to the physical stores. Once installed and registered MobiJuce™ App, mobile users can search the locations of nearby JuceBox kiosk. Scan the QR code on the JuceBox with MobiJuce™ App, users can choose to rent the appropriate JucePac. Three different types of JucePac are compatible with iPhone lightning, micro-USB, and USB-C connector. Each fully charged JucePac has a capacity of 4,000mAh. Users can rent and return JucePac at any JuceBox near them. MobiJuce™ technology ensures each JucePac is fully charged when being rented. Charging, renting and returning of JucePac is completely automated. MobiJuce™ App is a communication platform that enables self-service. The process of renting and returning is usually completed within seconds. Rental rate of JucePac is at HK$2 per 30 minutes, capped at HK$20 per day. To enjoy free deposit rental, users will have to add credit card details on MobiJuce™ App. A charge of HK$129 will be deduced from the Wallet when a JucePac rental period exceeds over 72 hours. MobiJuce™ App supports payment methods of Visa, Mastercard, PayPal and Apple Pay. A top-up amount of HK$149 is required for PayPal and Apple Pay when begins rental service. When MobiJuce™ registered members refer their friends to join the user community, they can enjoy 7 full-day JucePac rentals for free with a retail value of HK$140.00. A referral code is generated by the MobiJuce™ App when members invite their friends to download and register to become a user. A free rental coupon will be activated on the inviting member’s account when their invitees start using the rental service. Automated power bank rental service for young millennial add values to in-store shopping experience. Member referral program enlarges user community. [16th May, 2018, Hong Kong] MobiJuce™, a digital lifestyle brand, unveils the design of a JuceBox kiosk dedicated to leading jewelry retailer Chow Tai Fook Experience Shop. Chow Tai Fook customers and MobiJuce™ users can enjoy Hong Kong’s first and largest shared platform for mobile chargers at five Chow Tai Fook Experience Shops. “When MobiJuce™ App users search for JucePac power bank rental kiosks, the JuceBox, they will see Chow Tai Fook Experience Shops on their digital screens, as well as other JuceBox locations,” Ms. Wong explains. The customized JuceBox kiosks are dressed in rose gold color with matching pedestals. 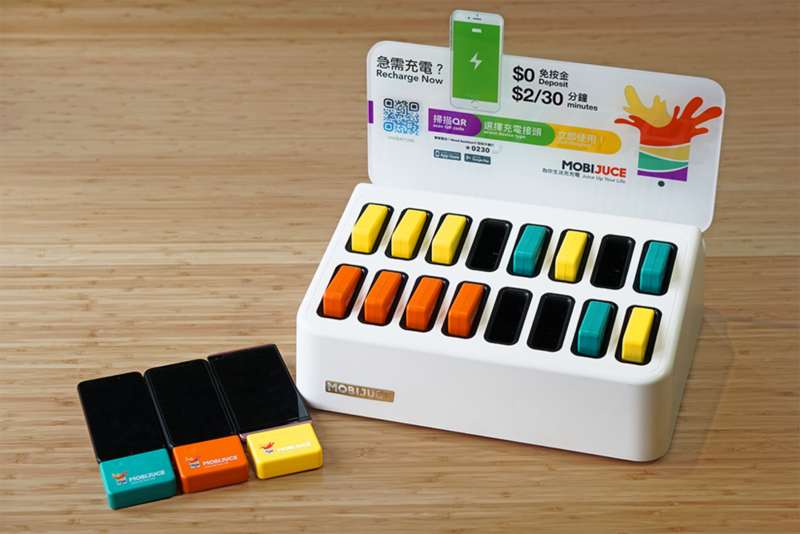 Each JuceBox is equipped with 16 JucePac power bank re-charging slots. MobiJuce™ App indicates locations of the JuceBox, the available number of JucePac and their types, in real-time. The new JuceBox kiosks are now in service at Chow Tai Fook Experience Shops located at APM in Kwun Tong, Festive Walk in Kowloon Tong, Metroplaza in Kwai Fong, Panda Place in Tsuen Wan, and Yoho Mall in Yuen Long. MobiJuce™ is a lifestyle brand in the digital age, leading a smart and intelligent consumer trend. In November 2017, MobiJuce Limited introduced a fully automated mobile charger rental service to Hong Kong for the first time. The concept of the Internet of Things allows consumers to enjoy convenient, mobile and rapid mobile re-charging solution on a shared platform, thanks to the clouds technologies. The slogan ‘Juce Up Your Life’ emphasizes on connecting consumers to retailers with their daily needs and developing a user-oriented shared economy. MobiJuce™ realizes a platform of smart living, a network of people, commerce, products, and flow while driving footfalls to the physical stores. At the time of this release, there are 35 JuceBoxes located across Hong Kong, Kowloon, and the New Territories. At Yoho Mall, there are 4 JuceBoxes in service at various retailers including Chow Tai Fook Experience Shops. Other popular MobiJuce™ locations are K11 in Tsim Sha Tsui, where 3 JuceBoxes can be found, as well as Grand Plaza and Gala Place in Mongkok, each has 2 JuceBoxes in the public area. When MobiJuce™ registered members refer their friends to join the user community, they can enjoy 7 non-consecutive full-day JucePac rentals for free. A referral code is generated by the MobiJuce™ App when members invite their friends to download and register to become a user. A free rental coupon will be activated on the inviting member’s account when their invitees start using the rental service. Once installed and registered MobiJuce™ App, mobile users can search the locations of nearby JuceBox kiosk. Scan the QR code on the JuceBox with MobiJuce™ App, users can choose to rent the appropriate JucePac power bank. Three different types of JucePac are compatible with iPhone lightning, micro-USB, and USB-C connector. Each fully charged JucePac has a capacity of 10,000mAh. Users can rent and return JucePac at the JuceBox. MobiJuce™ technology ensures each rentable JucePac is fully charged. Charging, renting and returning of JucePac is completely automated; MobiJuce™ App is a communication platform that enables self-service. The process of renting and returning is usually completed in one minute. Hong Kong, 8 March 2018 – MobiJuce, the first Shared Power Bank Rental service company in Hong Kong will launch a Free unlimited use Promotion in March. New and existing users simply enter the promotion code (MJ2W) after downloaded the MobiJuce APP and registeted an account can enjoy the charging service for free for two weeks*. By participating into various promotion activities, users can get more free charge offers. In addition, MobiJuce will be hosting various street promotion events across Hong Kong in March where the MobiJuce Ambassadors will giveaway promotion code for redemption. Participants who come and play the MobiJuce games may also win up to one month of free charging service*.